We plan to release version 2 of the AWS SDK for Ruby next week. We will remove the preview flag from the 2.0 version of aws-sdk. The AWS SDK for Ruby uses semantic versioning. Updates within version 1 are backwards compatible. Version 2 of the aws-sdk gem is not backwards compatible. If you depend on the aws-sdk gem today, and do not specify the major version, please add this now. If not, you may run into issues when you bundle update. If you receive this error, you likely have a dependency on aws-sdk and have updated so that you now have version 2 installed. Version 2 uses a different module name, so it does not define AWS. To resolve this issue, specify your version dependency as instructed above. The following diagram shows how the version 1 and version 2 gems are organized. The aws-sdk gem is empty, and simply requires version 1 or version 2 specific gems. This allows you to install version 1 and version 2 in the same application. 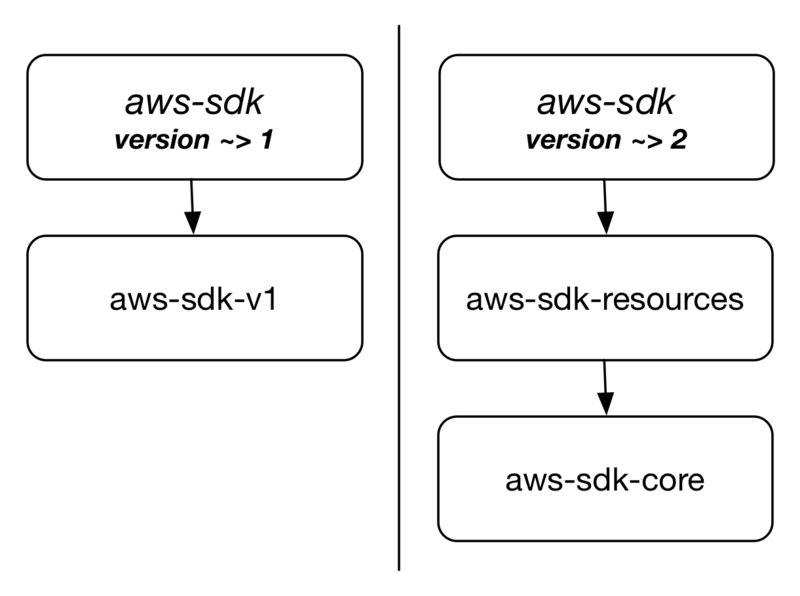 If you maintain a gem that has a dependency on version 1 of aws-sdk, I strongly recommend that you replace it with a dependency on aws-sdk-v1. This allows end users to require version 2 of aws-sdk. Please report any issues you have on our GitHub repository.